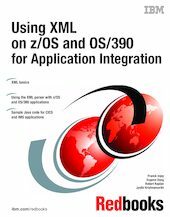 This IBM Redbooks publication will help you to understand how to integrate XML technology with business applications on z/OS. We start by providing a brief tutorial on XML, describing the advantages of its use. We explain its positioning, with emphasis on Java and the IBM WebSphere Application Server. We then document XML implementation on z/OS and describe the XML Toolkit for z/OS and OS/390, from installation to usage. We present examples of using XML on existing CICS or IMS applications, with a discussion of design alternatives, and explain how to install implementations in the WebSphere Application Server on z/OS. Finally, we provide sample Java code. This book shows developers how XML can be used to communicate with existing CICS or IMS back office applications, as well as how it can be used to design new applications on z/OS.